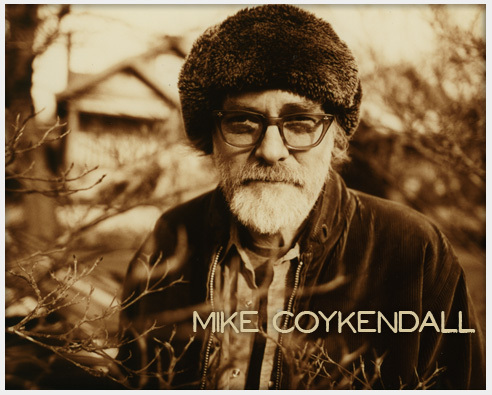 Veteran songwriter, producer and multi-instrumentalist Mike Coykendall has been amazingly prolific over the last three decades or so. Currently most well known for his duties as a sideman, producer, and recordist via his work with M Ward, Blitzen Trapper, She & Him, Annalisa Tornfelt, & Tin Hat Trio, to name a few, Coykendall has been making his own unique outsider records since the mid '80s. Coykendall (pronounced "Kirk-in-doll) was raised near the dead center of the contiguous 48 states of America in rural Norwich, Kansas. In early high school he began playing drums and guitar and went on to perform in mid-western regional cover bands during the early 80's. In the mid 80's he started writing and recording his own songs on cassette 4-track and soon formed Wichita, Kansas based prarie-psych popsters Klyde Konnor. Klyde was a prolific and daring band that self-released approximately nine cassette albums between '86 and '91. In '91, he moved to San Francisco where he and wife Jill formed The Old Joe Clarks. The Old Joes worked hard and made three nuanced, highly acclaimed Americana-esque records. 1996's Town of Ten, 1999's Metal Shed Blues, & 2003's November. In '99 after relocating to Portland, Oregon, Coykendall was able to expand his home studio and begin working other artists. One of those artists was M Ward. Their first collaboration was Ward's 2003 masterpiece Transfiguration of Vincent. Soon after, Coykendall became a member of Ward's touring band (also with She & Him), which continues to this day. In 2007 Coykendall finally gave up his day job to focus solely on music. Attrition pays off. In 2012 Coykendall released his third solo record titled Chasing Away the Dots via Portland’s Fluff & Gravy Records. Dots is a widely varied, moody yet playful record with a lived-in feel and is the perfect vehicle for Coykendall's unfurnished vocals. This tidy little diamond in the rough also contained guest appearances by some of Coykendall's musical friends including M Ward, Zooey Deschanel, Eric Earley, & Ben Gibbard. Translating Dots to a live setting was an undertaking, as the record itself was filled with guest performances and layers of studio psychedelia. Coykendall met that challenge by essentially turning the record inside-out and stripping it down to it’s basic elements. He took to rocking these songs out with an oversized Kay electric guitar while stomping a tin can kick drum and swishing away on a huge set of high-hat cymbals. He began calling it the "rig", and it stuck. These spontaneous performances are often a thick mix of Coykendall's own compositions and reinterpretations of other writer's famous or not-s0-famous gems. Not working from a set list and seemingly testing each situation to see what boundaries can be pushed. In late 2015 Coykendall will be releasing a new record called Half Past, Present Pending, partnering again with Fluff & Gravy Records. On this record, Coykendall takes the listener closer to the live "rig" performances by mixing excellent new compositions (check out "Hard Landing") with compositions from his back catalogue (check out "East of Cheney" or "Spacebaker Blues") in with fresh interpretations of other writers songs (he covers Roger Miller, Syd Barrett, etc) to great effect. What goes around comes around. He plans to be touring the states solo with the "rig" in late 2015 and on into 2016.